Art Design San Francisco was founded in July 2003 by Alyssa Morgan, along with help from artist Robert Hernandez. Morgan and Hernandez have worked together and with other community artists painting residential and commercial murals all over San Francisco. Community is very important to Art Design San Francisco, which donates time to local schools and community centers. An essential part of Art Design San Francisco's mission is to serve the public by donating time to support students, who might otherwise never know the power of art to tranform their environment. Working with Art Design San Francisco, students participate in creating public murals at their school. Students learn not only how to create art, but get to practice teamwork, cooperation, and other postive values. Our mission includes a passion to literally make our community an ever more beautiful place to be and live. We have worked closely with members of our community, such as District Superviosr Fiona Ma, Principal Beverly Kong of Lawton Alternative School, Home Depot, and Sunset True Value Hardware to ensure that elementary and middle school studetns have a creative experience by participating in the mural painting process. In addition to public works, we also specialize in residential murals. We are able to transform your home by painting custom children murals, ceilings, decorative faux finishes, and more! We have been featured on Comcast channel 11's Inside City Limits with host Tim Gaskin. In print, we have appeared in loal papers such as the S.F. Chronicle, Contra Costa Times, Express Magazine, and Mercury News. On-line, we have appared at The SFist and San Francisco My Way. Alyssa Morgan has been an artist all of her life. 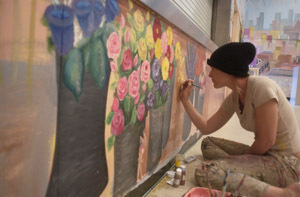 Growing up in Southern California, she started painting murals at age 12. After spending time in Portland, Oregon, Morgan moved to the Bay Area about 4 years ago, moving to San Francisco, where she resides with her daughters Quincy and Ava. In addition to painting murals, Morgan also has a passion for other kinds of artistic expressions, including pregnant belly casting, tree sculpture installations, paintings on canvas, and mixed media on canvas. Morgan feels extremely lucky to be able to have made her passion into a profession. She feels like she learns so much about life from her work. It is an additional privilege for her to be able to work with students and make a difference in her community. Morgan feels that art is a priority. Her household reflects that through a piano, a guitar, and endless artowrks all around her house. She tries to provide a stimulating and fun environment for raising her two daughers, who both paint and create music. Morgan's philosophy is that life is what you make it. She chooses to make her life fun and beautiful, trying to influence her daughters to do the same. Moving often as a child, Nicole Andrijauskas grew up constantly inspired by new surroundings. She built castles in the sand on the beaches of Miami and forts in the woods of Ohio. Her artwork reflects the anxiety she felt adjusting to new environments. Her art was a positive outlet and a life long passion, which she tries to share with others. Nicole currently resides in San Francisco, where she regularly contribures to her community and art community as a whole. With experience working in San Francisco art galleries, working with students on mural projects, and working on other public projects in the City, Nicole exhibits her own work on a regular basis. Nicole has a bachelor of arts in Fine Arts from San Francisco State University. Nicole focused on painting and textiles in her studies. She now applies those skills to current projects. 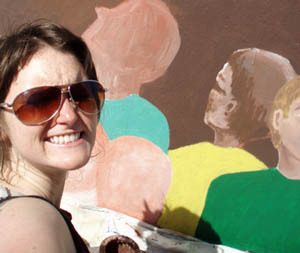 Nicole works with Art Design San Francisco where she hopes to continue to contribute to San Francisco culture. 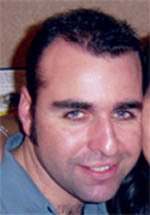 Tim Desoto was born in San Francisco in 1970 and rasied in Santa Cruz, CA. He has always found something to see in ordinary forms and cultivated a wide imagination. In high school, under the support and guidance from his teacher, Desoto developed an interest in drawing. Under his teacher's guidance, Desoto decided to enroll in Collins College, a graphics art school in Tempe, AZ, where he graduated with an AA in Fine Arts. Desoto began painting 10 years ago. He finds inspiration all around him He has a passion for the real, the unreal, and the random. Tim Desoto's paintings can be viewed by clicking on paintings. Robert Hernandez's love for illustration began in elementary school. Growing up in San Jose, Ca, he began to develop his illustrations by drawing military vehicles and bases. (His father having made his career in the Army). Hernanzes was a musician in high school. He joined a few local bands and began drawing fliers for various clubs, shows, and parties. Hernandez moved to Portland, Oregon and painted his first mural in the multi-cultural center at Portland State University. Upon returning to the bay area he moved to San Francisco and became a full time artist, being a major contributer to the founding of Art Design San Francisco. Hernandez has grown passionate about creating large scale works that will stand the test of time. Using a mixture of Renaissance figures and tattoo style designs he strives to make extremely complex compositions. He feels that through creating more complex works he will gain some understanding about life and it's complexities. Art consumes him and his studio/apartment is covered in canvas after canvas which he works on daily. He also paints public mural projects around the city. Hernandez is currently under contract to various hotels in the city.